On Ash Wednesday, March 1, TFP members began the distribution of 150,000 statements in brochure form by handing them out in the streets of Boston and New York. While many states extended their criminal and civil statutes of limitations for child sexual abuse during these four years of intensive media reporting on the scandals inside the Church, some states are looking at lifting them retroactively. Such measures would allow government to investigate decades-old cases and hold today’s 67 million Catholics responsible for damages. In light of this, the American Society for the Defense of Tradition, Family and Property (TFP) is vigorously protesting such legislative bills nationwide claiming the measures unfairly penalize Catholics in the pew and favor the agenda of dissident activists groups inside the Church. Indeed, organizations like Call to Action, Voice of the Faithful (VOTF) and Survivors Network for those Abused by Priests (SNAP) are actively supporting these retroactive legislative efforts, a fact that should make all Catholics seriously question if there is not more to these bills than meets the eye. The battle is heating up on many fronts. Archbishop Chaput also mentioned the tension and bias surrounding these bills in the Colorado Legislature. Indicative of this bias was the mistreatment of 17 year-old Patrick Chappell, a victim of sexual abuse by his employer, a one-time member of a local school board. Accompanied by his father, Patrick testified before the Judiciary Committee on February 2, arguing that true healing “does not come from chasing around the person who molested you 30 years ago.” Not only was Chappell frequently interrupted, but one state legislator tried to have him and his father removed from the Capitol. Ohio has its own battle with its bishops fighting SB 17’s one year “look-back” period. This bill was approved unanimously by the Ohio Senate in 2005, and is before the House Judiciary Committee at the time of this writing. On December 15, 2005, Columbus’ Bishop Frederick Campbell testified before Committee members urging them to delete the retroactive one year “look back” period clause. However, the impact of his presence and words was undermined by the January 11 written testimony and appearance of long-time liberal advocate Bishop Thomas Gumbleton (then auxiliary bishop of Detroit) before the same Committee. The American TFP published its statement, “Is It Fair That the Innocent Pay for the Guilty?” as a full-page ad in The Washington Times on February 9 and 13. 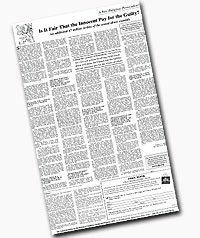 On January 4, 2006 the American TFP began its campaign on the issue by publishing the statement, “Is It Fair That the Innocent Pay for the Guilty?” on its web site.4 At the same time, the TFP sent an e-mail action alert to its 30,000 e-subscribers and thousands responded by urging the Ohio’s House Judiciary Committee to reject SB 17. The TFP web site sent additional e-mail appeals to the appropriate committee members in New York, Michigan, Iowa and Minnesota with similar results. The posting of the TFP statement was followed by its publication as a full-page ad in The Wanderer (February 8, 2006), The Washington Times (February 9 and 13, 2006), The Denver Post (February 19, 2006) and The Washington Times’ National Weekly Edition (February 20-26, 2006). The full text of the statement was also published in the March/April 2006 issue of Crusade. On February 9, 2006, reprints of The Washington Times ad were sent to 410 bishops and 38 Executive Directors of state Catholic Conferences. 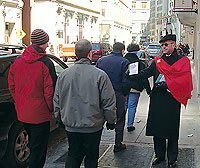 On Ash Wednesday, March 1, 2006, TFP members began the distribution of 150,000 statements in brochure form by handing them out in the streets of Boston Cincinnati and New York. On March 3, 2006, a professional recording of the TFP statement, together with an interview with popular EWTN program host Father John Trigilio, was sent to 85 Catholic radio stations. In late March, 2006, the full text of the statement was sent to 100,000 people on the TFP’s mailing list. Interestingly enough, the February 23, 2006 issue of Voice of the Faithful’s e-newsletter, In the Vineyard, manifested its annoyance with the TFP’s campaign. In the Denver section of its “Diocese Watch,” the VOTF newsletter states: “As VOTF prepares for what promises to be a long campaign toward accountability in our Church and the protection of children, there is a parallel ‘campaign’ being launched in various US [sic] dioceses.”5 The article cites the first paragraph of a February 18, 2006 TFP press release on its campaign with a link to the full text as posted by Catholic PR Wire, a Catholic news service. The TFP’s campaign is not “parallel” to that of VOTF. Rather, it collides head-on with VOTF’s support for the retroactive lifting of statutes of limitations and its efforts to change the Church’s divinely instituted hierarchical form of government. This position is laid out in the TFP’s December 2002 book, I Have Weathered Other Storms: A Response to the Scandals and Democratic Reforms That Threaten the Catholic Church. 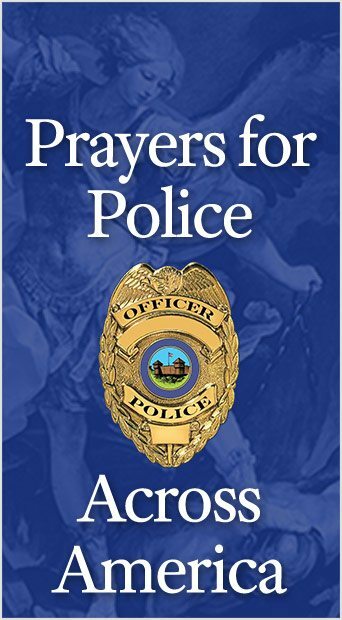 This book continues to be the backbone of TFP’s campaign in defense of the Church. Then as now, what needs to be emphasized is that the clergy sexual abuse crisis did not occur because of the Church’s hierarchical form of government where the Pope and bishops govern the Church, as the successors respectively of Saint Peter and the Apostles. Rather, the crisis is a result of the tragic inroads that today’s secular and hedonist culture has made into the sacred ranks of the clergy. Thus, the solution does not lie in replacing the hierarchical Catholic Church for VOTF’s “democratic” pseudo-church, but in a repentant and loving return to the fullness of Catholic truth, morality and holiness. “HB 1088, HB 1090, SB 143 bills are bad public policy, bad law,” Denver Catholic Register, February 8, 2006 (http://www.archden.org/dcr/news.php?e=351&s=2&a=7360). “Senate Bill 143: Sorting through the evasions—When it comes to this bad bill, supporters have one new alibi after another,” Denver Catholic Register, February 15, 2006 (http://www.archden.org/dcr/news.php?e=352&s=2&a=7385). “Gumbleton reveals he was sexually abused by a priest,” National Catholic Reporter, January 11, 2005 (http://www.nationalcatholicreporter.org/update/bn011106.htm). In the Vineyard, February 23, 2006 (http://www.votf.org/vineyard/Feb23_2006/index.html). This entry was posted in Catholic Perspective, Events of 2006, Fighting the Culture War, The Church Shall Prevail and tagged Catholics, Colorado, Denver, offensive, retroactive, states, statutes of limitation, TFP, The Church Shall Prevail by Raymond Drake. Bookmark the permalink.